Safety experts are inspecting the car park at a Bournemouth shopping centre after concrete fell from the roof. An area of the 3,000-space car park at the Castlepoint Centre was sealed off after the incident last Saturday. Temporary safety netting has been erected in the east car park, while around 1,000 parking spaces remain sealed off to the public. 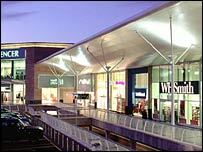 The 41-acre centre has 40 shops and opened in October 2003. It is operated by Standard Life Investments. A statement from Castlepoint management said: "Whilst the installation of netting is seen as a temporary measure, the overall structural integrity of the car park has been confirmed by independent consultants and car park engineers. "Further sections of the lower level will re-open pending approval."